As for Breakout Con, I will be writing up a separate post all about that great event. 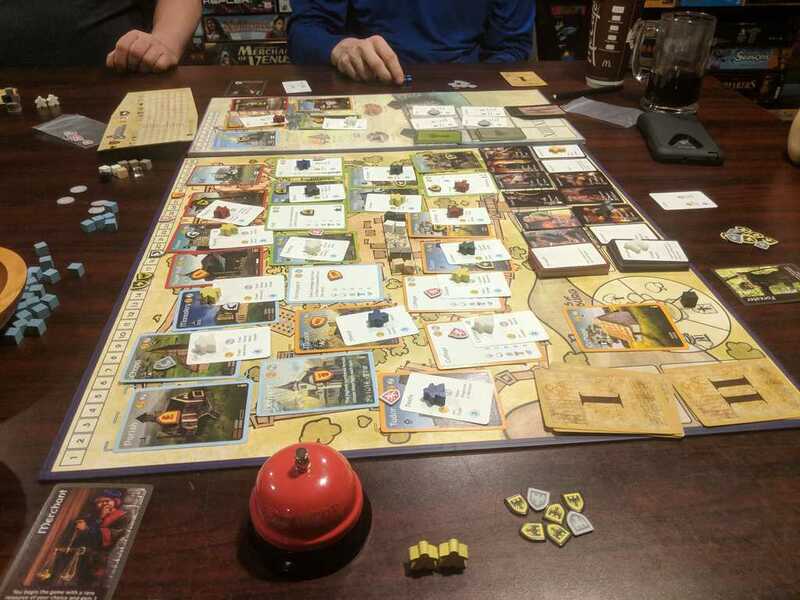 I first got to try Builders of Blankenburg back in May 2015. 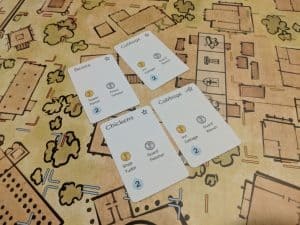 Back then I was approached by Peter Schultz of Cobblestone games who asked me if I would be interested in doing a preview of a prototype game they were working on. They would send me the prototype, I would check it out, review it and offer some feedback and in return, they would send me a production copy of the game once it was published. Now this was the early days of Kickstarter and there was no guarantee the game would be published, but based on what Peter told me about it, it sounded like a solid game and worth giving a shot so I agreed. You can read that initial review over on my old Windsor Gaming Resource Blog. 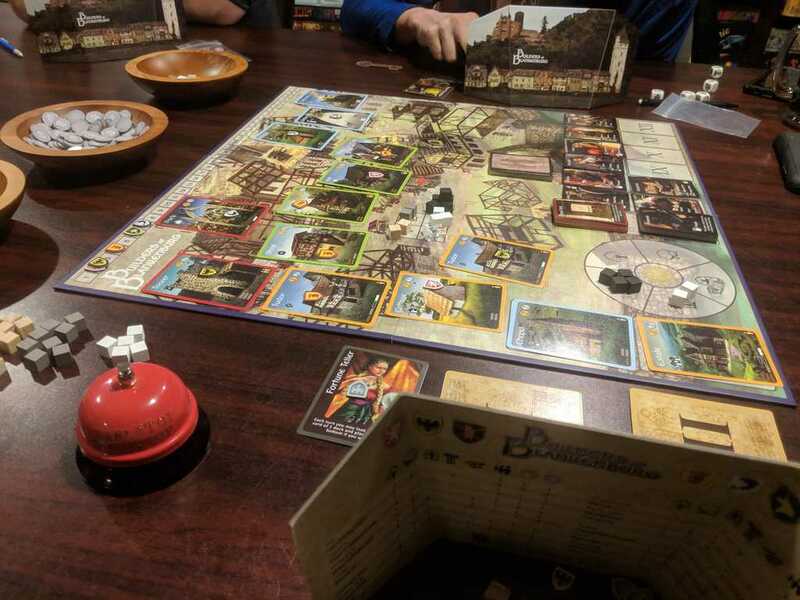 I liked Builders of Blankenburg back then and still enjoy the game now. There were very little changes between the prototype I played and the full production copy of the game. A two-sided board and rules for playing up to 6 players are the most noticeable change. A few more events and citizens were added as well, which I think were stretch goals for the Kickstarter. 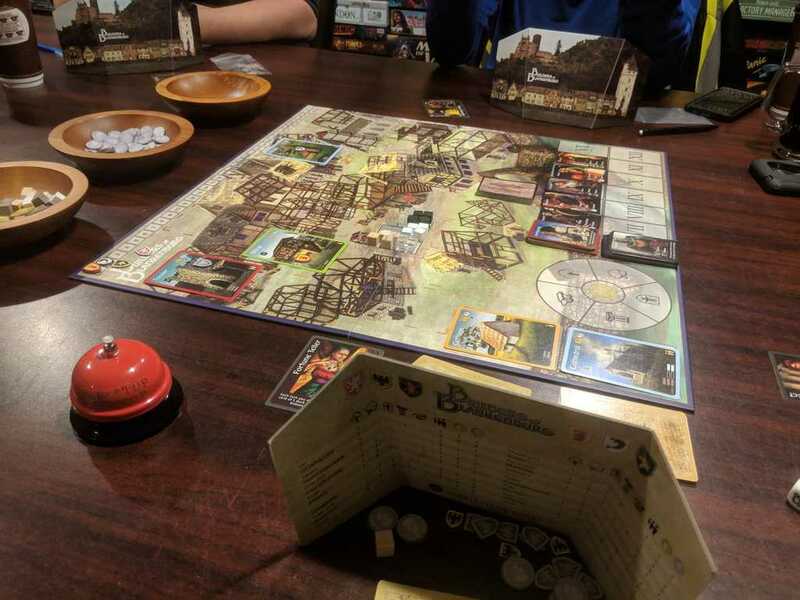 In Builders of Blankenburg, you are building the medieval town of Blankenburg. Each round new citizens move into the town, looking for places visit. Each citizen card lists three places that the person wants to stay in order of preference. Players are going to collect resources and attempt to build these buildings, hoping to have the buildings that appeal to the most citizens. Buildings aren’t very large though, most only have space for one or two citizens. To build these buildings players take part in a resource auction as well as trading in a public market. In addition to points for building buildings and money from attracting citizens, there’s also an area control aspect split over four regions of the city. Events and Visitors also add a random element to the game, bringing either positive or negative events and encounters each round. 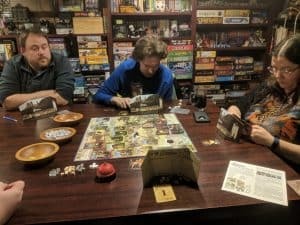 We played a five player game on Monday and I was reminded just how much I enjoy this game. It’s not one you hear talked about often and I was a bit worried that the game may feel dated. It did not. While it had been a couple of years since I’ve played I found I still really enjoyed it. I really love the citizen mechanic and working through the row of citizens each round to confirm where each will stay. Even more so, I love building that perfect building that steals one or two citizens away from another player. When we finished the game the main thing I was thinking is that I need to bring this game out to public play events more often and let more people know about it. It really is a hidden gem that I think got missed because it’s independently published and not from a major publisher. 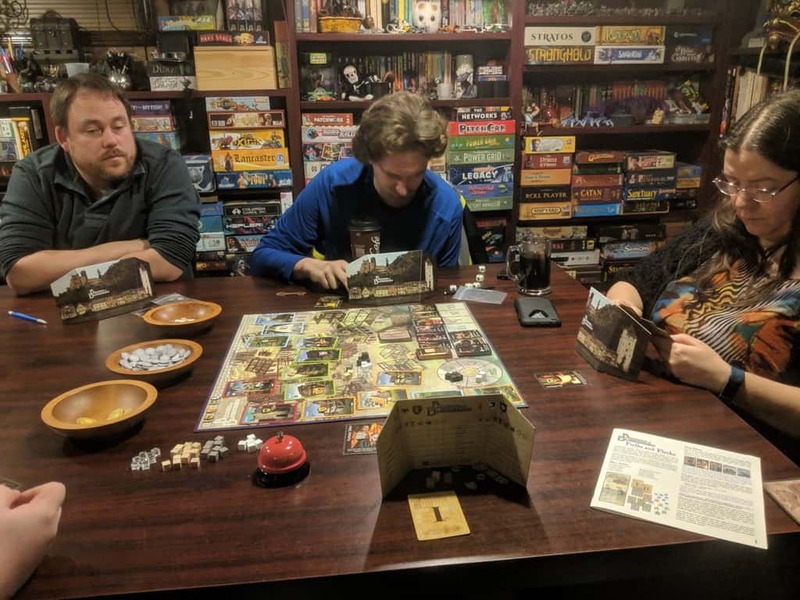 Obviously, Builders of Blankenburg did get funded back in 2015 and I like to think my review was part of that success. I’m assuming that’s why Peter contacted me again late last year, asking if I would be interested in doing another preview. This time for an expansion they were working on for Builders of Blankenburg called Fields and Flocks. Based on how much I enjoyed the original game, I agreed right away. 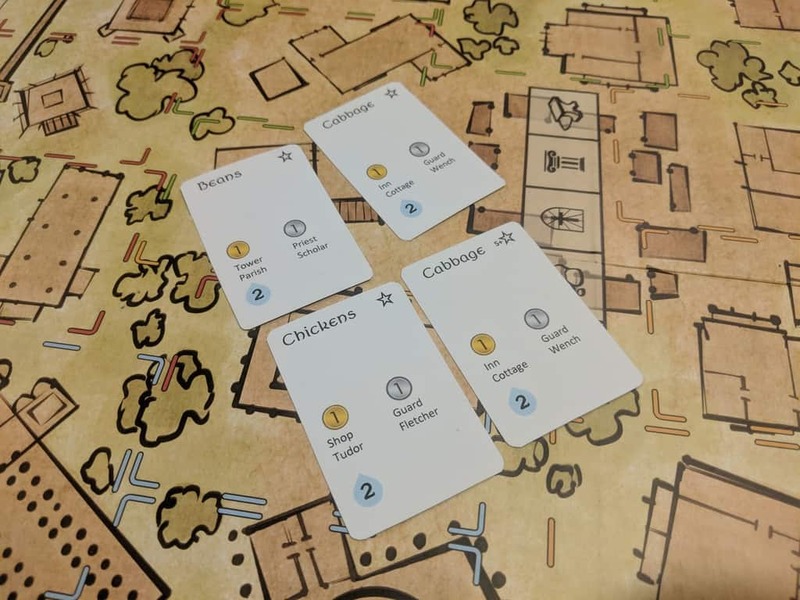 So after our play of the base game last Monday, I broke out Fields and Flocks and we gave it a shot. Now I have to say right away: we played wrong. The rules are still a work in progress. There was some information missing and some stuff that we misunderstood. After the game I wrote Peter with some concerns we had and it ended up that every one of them was something we did incorrectly. For example in the pictures I’m sharing here you can see Field and Flock cards on buildings. That was something we found made the game feel cluttered, it was also something we played wrong. Attached cards are discarded to the bottom of their decks, only the meeple are put on the board. These are my initial thoughts, after only one playthrough and while playing some things wrong. I will be doing up a full review after I’ve played with Fiends and Flocks a few more times with the proper rules. 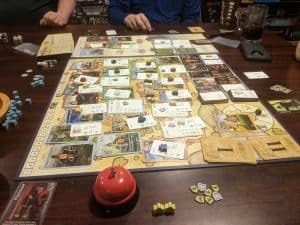 Fields and Flocks adds a new board to the game. This not only adds more building spots and a longer citizen track, adding more time to the game but also adds a new worker placement element. You now get a number of serfs that are used to tend to fields and plant flocks. Both Fields and Flocks are represented by cards and these are acquired by spending silver and using a serf to obtain the cards. Both types of cards come with a number of water tokens. Serfs are used to remove these tokens and once the last is removed the Field or Flock is ready. Ready Field or Flock cards can be used to sell goods to the citizens in town or attached to a building in town. Selling goods gets you money while attaching gets you prestige (points). 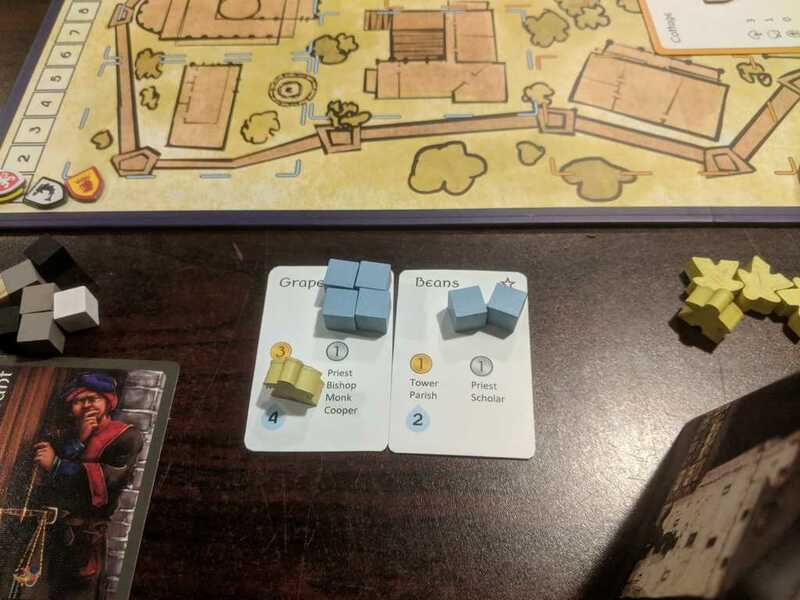 Attaching a card to a building also ties up one of your serfs for the rest of the game. So far I’m digging this expansion. It adds quite a bit to the game. It is almost like another full mini-game inside the original. This makes the game not only longer, but much heavier. The cognitive load is significantly increased by adding Fields and Flocks. Remember: I’ve only played Builders of Blankenburg with Fields and Flocks once so far and we did make some mistakes. So be sure to watch the blog for a full preview in the coming weeks. It’s expected that Fields and Flocks will launch on Kickstarter in April. So that’s what hit my table this past week. What hit yours?